I swear by the dawn, [89:1] and by the Ten Nights, [89:2]. In line with a series of questions and objections received on the rulings of Hanafi Madhab, the format of this article has been slightly modified to address the objections which were raised in an email. We would like to specifically acknowledge the time and effort of (Mufti) Mohammed Ashfaq (Bradford) who provided valuable assistance in providing Ahadeeth for this article. (Qari) Muhammad Shoyaib Nurgat (HA) has done a review of the article in general. Please inform us of any typos or errors which remain and we will make Dua for you. Should Dhul-Hijjah start with the Moonsighting of Saudi Arabia? There is no evidence to tie the start of Dhul-Hijjah to the Moonsighting of Makah. Each location should sight the Moon (locally) and begin the blessed month of Dhul-Hijjah according to their own local sighting. It is not an obligation or even a recommendation to start the month with sighting in Makkah or to tie it with the dates of Hajj. One of the wives of the Prophet (Sallallaho Alaihe Wassallam) said: "Allah's Messenger (Sallallaho Alaihe Wassallam) used to fast the [first] nine days of Dhul-Hijjah, the day of 'Ashurah, and three days of each month." [Abu Dawud]. [2:203] Recite the name of Allah during the given number of days. Then whoever is early in leaving after two days, there is no sin on him, and whoever leaves later, there is no sin on him, if he is God-fearing. Fear Allah and be sure that you are going to be gathered before Him. When Ibrahim (AS) began moving the knife on his beloved son, Ismaeel (AS), the angels sent by Allah with a ram exclaimed. Allahu akbar, Allahu akbar (Allah is the greatest, Allah is the greatest). Ibrahim (AS) heard the voice of the angels and replied, La illah illa Allahu Wallahu akbar (There is no god besides Allah, and Allah is the greatest). His son Ismaeel (AS) heard this conversation and understood that Allah had relieved him from this great rial, thus he replied, Allahu Akbar Walillahil hamd (Allah is the greatest, and to Allah belongs all praise)(Ibid). What is the injunction about clipping nails or trimming any hair or trim if one is preparing to make a sacrifice for Eid? There are two opinions about the matter. According to Imam Abu Haneefa (RA) and earlier scholars of the Hanafi Madhab it is permissible to clip nails or trim hair and there are no restrictions. The second opinion is of later scholars (of the Madhab) and it has become popular amongst the masses. This (second) opinion states that it is Mustahab (recommended) to refrain from clipping nails and trimming hair if a person is intending to perform Udhiyah/Qurbani (sacrifice). However it must be noted that scholars who advocate restriction, also state that if the nails become too long and the hair (particularly from the private areas) become long, they should be trimmed and clipped. Question: Is there any evidence of making Udhiyah/Qurbani (sacrifice) in the Qur'aan? [108:2] So, offer Salah (prayer) to your Lord, and sacrifice. [6:162] Say, My prayer, my offering, my life and my death are for Allah, the Lord of all the worlds. Question: Did Nabi (Sallallaho Alaihe Wassallam) offer Udhiyah/Qurbani (sacrifice) every year? Question: Did Nabi (Sallallaho Alaihe Wassallam) advise his companions to offer Udhiyah/Qurbani (sacrifice)? Question: Why Nabi (Sallallaho Alaihe Wassallam) advise should offer Udhiyah/Qurbani (sacrifice)? It should be noted that the sacrificed (Nah'r) during Eidul-Adha is one of the most emphasised and virtous acts and beloved to Allah (SWT). حَدَّثَنَا أَبُو عَمْرٍو، مُسْلِمُ بْنُ عَمْرِو بْنِ مُسْلِمٍ الْحَذَّاءُ الْمَدَنِيُّ حَدَّثَنَا عَبْدُ اللَّهِ بْنُ نَافِعٍ الصَّائِغُ أَبُو مُحَمَّدٍ، عَنْ أَبِي الْمُثَنَّى، عَنْ هِشَامِ بْنِ عُرْوَةَ، عَنْ أَبِيهِ، عَنْ عَائِشَةَ، أَنَّ رَسُولَ اللَّهِ صلى الله عليه وسلم قَالَ ‏"‏ مَا عَمِلَ آدَمِيٌّ مِنْ عَمَلٍ يَوْمَ النَّحْرِ أَحَبَّ إِلَى اللَّهِ مِنْ إِهْرَاقِ الدَّمِ إِنَّهَا لَتَأْتِي يَوْمَ الْقِيَامَةِ بِقُرُونِهَا وَأَشْعَارِهَا وَأَظْلاَفِهَا وَإِنَّ الدَّمَ لَيَقَعُ مِنَ اللَّهِ بِمَكَانٍ قَبْلَ أَنْ يَقَعَ مِنَ الأَرْضِ فَطِيبُوا بِهَا نَفْسًا ‏"
Question: Who Nabi (Sallallaho Alaihe Wassallam) advise should offer Udhiyah/Qurbani (sacrifice)? Question: Did Nabi (Sallallaho Alaihe Wassallam) offer more then one Udhiyah/Qurbani (sacrifice)? Question: Should there be multiple intended Udhiyah (sacrifices) within the same animal or should a single Udhiyah (sacrifice) be intended to be given on behalf of a single person, when it is obligatory? What about when it is not obligatory but intended to gain extra rewards? When a sacrifice is obligatory, a single Udhiyah (sacrifice) is sufficient for the single person. It is permissible to make multiple intentions in a single Udhiyah (sacrifice) for gaining (extra) reward when these Udhiyah (sacrifices) are not primary. This is clearly indicative from the wordings of these narrations and scholars of Hadeeth have deduced that these narrations are regarding the circumstances when it is intended to send extra reward to household or family members. Question: Is it permissable to offer Udhiyah/Qurbani (sacrifice) in another country or appoint someone else to do it on your behalf? Question: Can extra Udhiyah/Qurbani (sacrifice) be offered with an Intention of reward for others including Nabi (Sallallaho Alaihe Wassallam)? There are multiple narrations quoted above which emphatically prove that Nabi (Sallallaho Alaihe Wassallam) himself offered multiple sacrifices on behalf of his family or even us (his Ummah). Therefore, there is no prohibition in offering sacrifices to send the reward of family/friends/relatives whether alive or deceased. Nabi (Sallallaho Alaihe Wassallam) himself offered sacrifice on our behalf so we can also offer sacrifice and make dua for the reward to be sent to him. Question: Do you have to recite the name of the people who are offering Udhiyah/Qurbani (sacrifice)? Intention is an action of the Heart and not the Tongue so no need to recite names. But if a person gives names to an organisation or an abattoir for Administration reasons or they read the names out for Administrative purpose e.g. “This sacrifice is for Mohammad Khalid” etc there is nothing wrong with it. This is not a requirement, the mere intention of the person will suffice. Question: During the days of Eidul-Adha is it better to offer Udhiyah/Qurbani (sacrifice) or give Charity (in general)? Question: What is the Method of Salah Eidul-Adha? Question: Is there an obligation to perform Jumu’ah (Friday) prayers if it falls on the day of Eid? Jumu’ah (Friday) and (Eidul-Adha) prayers are two separate obligations and both remain necessary on an individual. If the day of (Eidul-Adha) falls on a Friday, the obligation of Jumu’ah (Friday) prayers is neither lifted nor reduced and it has to be performed. Allahu Akbar, Allahu Akbar... La Ilaha Illallahu, Wallahu Akbar...Allahu Akbar wa lillahilhamd. 1 To wake up early in the morning. 4 To put on one's best available clothes. 6 Not to eat before the Eid prayer. 7 To recite the Takbir of Tashriq in a loud voice while going to the Eid prayer. Note: The way of Eid prayer described above is according to the Hanafi school of Muslim jurists. Some other jurists, like Imam Shafi'i, have some other ways to perform it. They recite Takbir twelve times before beginning the recitations of the Holy Qur'an in both the raka'at. This way is also permissible. If the Imam, being of the Shafi'i school, follows this way, you can also follow him. Both ways are based on the practice of the Holy Prophet, Sall-Allahu alayhi wa sallam. 1 Goat, either male or female, of at least one year of age. 2 Sheep, either male or female, of at least six months of age. 3 Cow, ox buffalo of at least two years of age. 4 Camel, male or female, of at least five years of age. 1 Blind, one eyed or lame animal. 2 An animal so emaciated that it cannot walk to its slaughtering place. 3 An animal with one-third part of the ear or the nose or the tail missing. 4 An animal that has no teeth at all, or the major number of its teeth are missing. 5 An animal born without ears. 1 A castrated he - goat. (Rather, its Qurbani is more preferable). 2 An animal that has no horns, or its horns are broken. However, if the horns of an animal are uprooted totally so as to create a defect in the brain, its Qurbani is not lawful. 3 An animal the missing part of whose ear, nose or tail is less than one third. 4 A sick or injured animal, unless it has some above mentioned defects rendering its Qurbani unlawful. 1 Hajj is obligatory on every adult Muslim who can afford to go to Makkah during the hajj season, whether on foot or by any other carriage. 2 If a person can travel to Makkah to perform hajj, but he cannot travel to Madinah, hajj is obligatory on him also. He can perform hajj without visiting Madinah. 3 A Muslim woman cannot travel for hajj unless she is accompanied by a mahram (i.e. husband or relative of a prohibited degree like son, father, brother etc.) If she does not find any mahram to accompany her, hajj is not obligatory on her until she finds one. However, she must make a will that in case she dies before performing hajj, his heirs should arrange for her hajj-e-badal out of her left over property. This oath substantiates the greatness and sacredness of these ten nights in the eyes of Allah. This is an extra ordinary oath; it is very reliable and significant and the wise men can understand that by this oath, Allah too attaches great importance and value to the ten nights of Zul Hijjah. If one was to remain in Arafaat for many months after the 9th Zul Hijjah, he will not receive any reward whatsoever and it will never be considered an act of ibaadah. Similarly, Qurbaani is performed only in three days one of which is 10th Zul Hijjah. There is no possibility whatsoever of a nafl Qurbaani once these days have lapsed, so much so that qazaa Hajj or qazaa Qurbaani is not even possible. 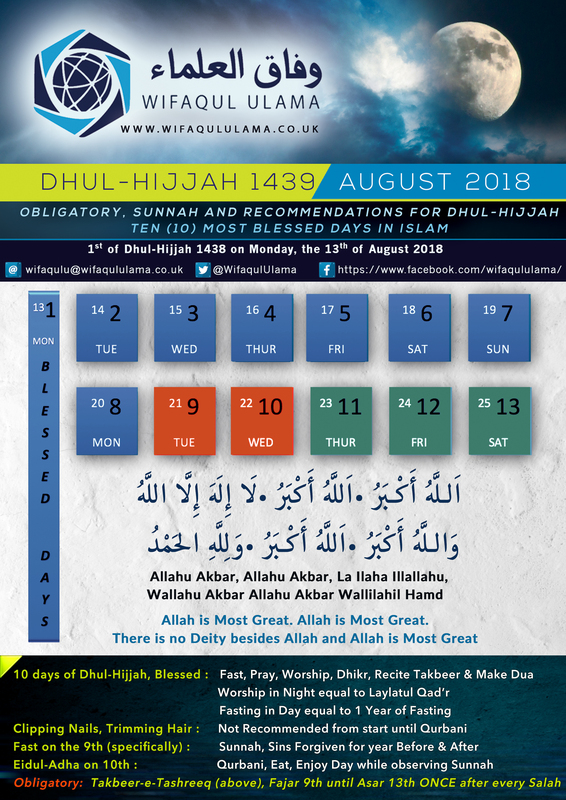 It is because of these distinguishing characteristics that the ulamaa have stated, in the light of Qur'aan and Hadeeth that after the days of the month of Ramadhaan, the greatest days in virtue are the first ten days of Zul Hijjah. 2 These days are so blessed that a day's fast is equivalent to a year's fast and a night's devotion is equivalent to the ibaadah of Laylatul Qadr. The indication is towards the fact that we should endeavor to perform as many virtuous acts as possible in these days. 4 The reciting of Takbeeraate Tashreeq after every fardh Salaat from the Fajr of 9th Zul Hijjah to the Asr of 13th Zul Hijjah (i.e. total of twenty three fardh Salaat). It is waajib upon men to recite this takbeer once after every fardh Salaat audibly. The women should recite it silently. 5 The Sunnah of Ibraahem alayhi salaam - the Qurbaani. It is to be performed on 10th, 11th or 12th Zul Hijjah. One may sacrifice a thousand animals on days other than these, but it will never be regarded or considered a Qurbaani. May Allah ta'aalaa bless us with spiritual gains and His Pleasure in these blessed moments. Aameen.